Sources of lean protein include white meats and legumes or beans, although many other foods contain some. Two small pancakes provide 6 grams. What you really want to be sure to do is to avoid the “bad” sources and of course I feel like a non-plant protein source is a better option. Most of the bad sources are red meats. But let me add that not all are bad as long as it is lean and in moderation, once or twice a week. Red meats include beef, mutton, lamb, veal, goat, venison and pork. Claims that pork is “the other white meat” are scientifically inaccurate. 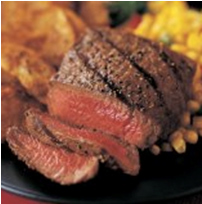 Red meats can be bad because some cuts are high in sodium and saturated fats. Both increase your risk of heart disease. Processed meats like hot dogs are also bad sources. Like unprocessed red meats, they’re also high in sodium and saturated fat, but are accompanied by the additional risk of nitrates and nitrites, which are converted into cancer-causing chemicals in the digestive system. If you or your children must eat a hot dog, there are a few brands on the market that are nitrate and nitrite free. 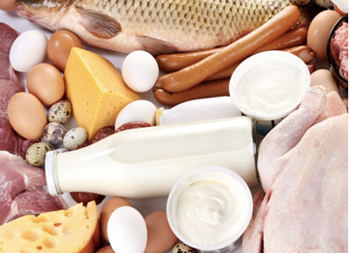 The best sources of lean protein are going to be white meats which include poultry, fish and other seafood. Chicken and turkey are the two most popular types of poultry. 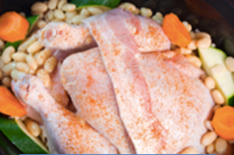 The dark meat (legs, wings, thighs) contains more fat, but the breast meat with the skin removed is very low in fat. 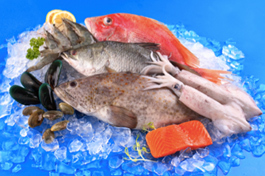 Sources of lean protein also include fish and are generally low in fat. Fatty fish, such as salmon and tuna, contain very little saturated fat and are good sources of polyunsaturated omega-3 fats, which are important for heart, circulatory and brain health. A minimum of two servings a week of fatty fish is recommended for adults in order to provide the essential omega-3s DHA and EPA. Other types of seafood are also lean protein foods. Shrimp is relatively high in cholesterol, but research suggests that dietary cholesterol does not contribute to high cholesterol in the bloodstream. Saturated fat is the big problem for high cholesterol and high blood triglycerides, risk factors for heart disease. There are also plant-based sources of lean protein. Legumes or beans are the leanest of all because they do not contain fat unless it is added as a flavoring. The soybean is a lean protein food that for practical purposes can be considered equivalent in quality to that of meat. But some people are sensitive to soy, and there is controversy as far as its effects on the body. So, other beans may be better dietary choices. I personally do not care for soy products at all. But overall in the sources of lean protein, the benefit of beans is that they provide dietary fiber. Other health benefits of increased intake of dietary fiber may include better cholesterol levels, a reduced risk of heart disease, a reduced risk of high blood pressure, a reduced risk of type II diabetes, better bowel function and easier weight loss. Egg whites are fat-free, cholesterol-free sources. All of the cholesterol is in the yolk of the egg. 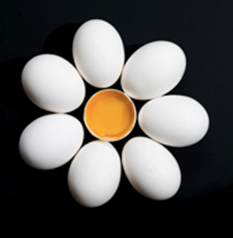 Egg yolks vary in terms of their fatty acid profile, depending on how they are raised and fed. For example, eggs from free-range hens are higher in omega-3 fatty acids and lower in cholesterol than those produced on factory farms. I eat 1 whole egg and 3 egg whites every morning for breakfast! If you are looking for a lean body protein shake, whey is a good source to look for. Whey is derived from dairy products but is not a source of dietary fat. The shakes on the market differ greatly in quality. Some are high in sugar and contain other unhealthy ingredients. So remember to read consider putting it in your mouth. As you can see, they are many sources of good proteins to choose from. The important thing to remember is get enough of it in your diet to build and maintain your lean muscle for a beautiful fit body!